FLORASSIST® GI with Phage Technology. FLORASSIST® GI's dual-action formula contains a proprietary probiotic blend and a TetraPhage blend. 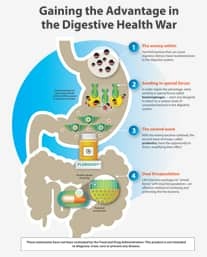 This Phage technology affects only undesirable bacteria, while leaving the "good" bacteria of your digestive system alone to generate a balanced environment most conducive to digestion and whole body health. You’ve just started your journey to better digestive health. Make sure you continue using FLORASSIST® GI with Phage Technology to stay on track. × FLORASSIST® GI with Phage Technology has successfully been added to the list . FREE GIFT of FLORASSIST® GI. Probiotics help balance the ratio of good-to-bad bacteria in your intestines. Now there’s a probiotic supplement that helps tilt that ratio in your body’s favor: FLORASSIST® GI. FLORASSIST® GI contains a bacteriophage blend that targets unwanted bacteria. This phage technology affects only undesirable bacteria while leaving the “good” bacteria of your digestive system alone. 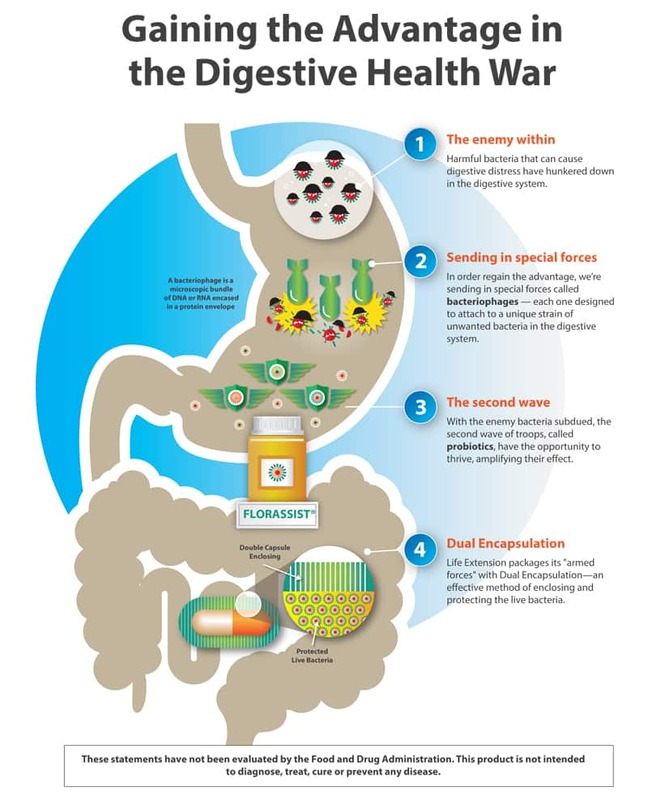 This dual-action formulation then delivers a proprietary probiotic blend via a dual-encapsulation delivery system that protects the beneficial strains from the harsh environs of your stomach. Switch to FLORASSIST® GI with Phage Technology today! You will be Adding FLORASSIST® GI with Phage Technology to the list . A bacteriophage is a submicroscopic bundle of DNA or RNA encased in a protein envelope — each one is designed to attach to a unique strain of unwanted bacteria in the intestines. The TetraPhage Blend in FLORASSIST® GI only targets specific strains known to inhibit beneficial bacteria. This comprehensive formula offers a unique approach to restore the microbiome to a healthy balanced state.5 Choose FLORASSIST® GI with Phage Technology to support your gastrointestinal health today! Infect Dis Clin North Am. 2016 Jun;30(2):313-22. Med Sci Monit. 2008 Aug;14(8):Ra126-32. Mayo Clin Proc. 2014 Jan;89(1):107-14. Data on File. Vol 2015. Adv Drug Deliv Rev. 2016 May 5.